A cyber village connecting writers, music lovers and creative folk. A significant portion of my Rhythms & Muse women’s fiction novel takes place in 1970s Coeur d’Alene, Idaho, and Spokane Wash., so it seemed natural to create a trivia blog entry or two about some of the places and activities mentioned in the book. Do you know the area? How many answers can you get correct? 8. THE 1970s local hangout after ball games and music concerts was a wooden structure with tall slanted windows, just around the corner from downtown Coeur d’Alene. Do you recall its name? 9. The sledding scene in the novel was inspired by a favorite hill just up from where the author used to live off the Cd’A public golf course. What’s the name of this neighborhood? 10. Student musicians would travel to this city, home of the University of Idaho, to compete in “State” where judges rated their talent/skills. 11. You’ll probably need to have been friends with the author to know this one, but what color and make was the family car Ann drove during high school? 12. What is the name of the 17-acre public park named located just west of downtown Cd’A? 13. You can go for a 2.2 mile hike right from downtown Coeur d’Alene in a 164-acre urban wilderness area. Named for a German immigrant who was Coeur d’Alene’s first Justice of the Peace, this area is called…? 14. Hundreds of bird species are found in Northern Idaho, including majestic bald eagles. What other bird-of-prey, known for building nests on top of lake pilings, is prevalent in Cd’A? More Cd’A trivia (part 3). Novel available at my CreateSpace novel eStore (best value to author) and Amazon.com (convenient). Music CD and MP3 files available via my CreateSpace CD eStore and on Amazon.com. Amazon also provides audio samples of each track. 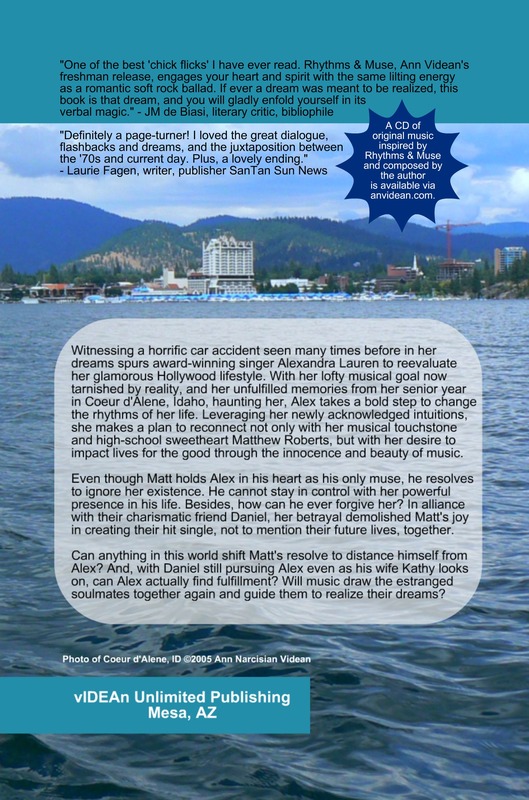 This entry was posted in All Posts, Coeur d'Alene, ID, Rhythms & Muse novel, Words: Serious Play and tagged Ann Narcisian Videan, Coeur d'Alene, Coeur d'Alene Trivia, Rhythms & Muse, Videan by Ann Videan. Bookmark the permalink. 8. Pappy’s Pizza which, sadly, is long since closed. 9. Fairway Hills. The Narcisians lived in the big red house at the bottom of the hill on Fairway Drive from 1971 to 1991.